This article is about the 4X game. For other uses, see Star (disambiguation). Stars! is a turn-based strategy, science fiction 4X game. Stars! was developed by Jeff Johnson and Jeff McBride ("the Jeffs") for their own use, and initially released as shareware in 1995. A retail version was later produced for, and published by Empire Interactive, with developer Jason Gaston added to the team for QA, although the shareware version continued. Starting with a small fleet of ships and one or two planets, players develop their empire, meet other races and conquer the galaxy. Stars! games begin with race design, choosing one of 10 different primary racial traits, a selection of lesser racial traits, habitability, growth, economic and technology settings. The graphics are entirely 2D, and consist of the main map view and static pictures of planets, ship hulls and components. Battles consist of moving static icons around a grid. Because of the high level of micromanagement and diplomacy requirements many games take place over a period of months between players spread across the galaxy. Players initially send scouts out to scan for suitable planets which may be later colonized and developed, enlarging the player's empire and providing additional resources. As a player's empire expands the player must balance the management of population, minerals, research and ship/infrastructure constructions. When other players' races are encountered, a variety of diplomacy options allow for alliances, trading mineral resources or technology, large-scale wars, and even the complete destruction of other races. If the random events game option is enabled, players will also have to contend with (or take advantage of) the Mystery Trader, comet strikes, wormholes and environmental changes. The game is well adapted to the Play-By-Email (PBEM) style of multiplayer gaming. One player takes on duties as host, and the other players send their instructions (turn files) by email to the host. The host then generates the results of those instructions and emails back the results. An alternative to play-by-email is to use an online system such as the Stars! AutoHost. This system automates most of the hosting duties, and can handle a large number of games simultaneously. Many games are run at a rate of 1 turn per calendar day, giving plenty of time for strategic thinking. In large games this can be quite necessary, with turn generation dropping to only 3 times per week in cases, due to the complexity of the game and the level of micro-management required to effectively control a large empire competitively. To foster better understanding of the game, Mare Crisium paid members of the player community to write and edit (Kearns, Clifford, Steeves) an in-depth Strategy Guide in 1998. There is also a reasonably competent artificial intelligence (AI) that can take part in the game. The player can opt to play against AIs only (up to 15 of them), and this is the way that new players typically get to learn the game mechanics before launching into multi-player games. A well-regarded tutorial helps with getting started. Another style of play is referred to as a Blitz game. In these games, turns are played every 15 minutes or so, and all players must be at their computers at the same time. Blitz games are generally more tactical and less political in nature, due to the time constraints involved. The duel has become more popular. These are similar to regular turn-a-day games but are between two players only. Again, with only two players involved there is no political side to these games. The game was originally developed in 1995, with version 2.0 released early in 1996. 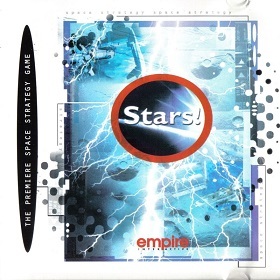 Later that year the newsgroup rec.games.computer.stars became active, facilitating public discussion of tactics and allowing players to find new games. By the end of 1996 shareware version 2.60 had been released, and the game has remained essentially unchanged ever since, although there have been numerous updates. Version 2.70 is the retail version which has battle sounds and allows research past Level 10 (the shareware version is restricted). The latest file date on the retail version CDROM is January 8, 1997; it sold for $41 before tax at Media Play in the southeastern U.S. in February, 1997. The manual was 15mm thick (over half an inch), but the game only needed 2MB of installation space. The most recent patch version, 2.60j RC4 (release candidate 4) was released in December 2000. Versions 2.60 and 2.70 are compatible as long as the minor version letter is the same (e.g. : 2.60i can play with 2.70i players). Over the years a number of third-party developers have provided tools and utilities to help players manage their empires. Stars! has received some generally positive reviews. PC Gamer UK's reviewer Andy Butcher gave the game a rating of 79% in its February 1997 issue, commending it with the following comment: "What makes it stand out from the many games based on a similar idea are its depth, and that it's been designed right from the start with multi-player gaming in mind". Pitfalls he mentions include that the large number of options available can make the game confusing, and that the game is likely to be less appealing to single players. GameSpot's reviewer T. Liam McDonald rated the game 7.3 "Good", applauding "a solid Windows interface, plain graphics, a wide range of custom options, deep strategic content, and compulsive playability" and stating that the game outdoes the similar game Spaceward Ho! 4.0. The huge popularity of the original Stars! game convinced the developers that there would be a market for a sequel. The developers of Stars! formed a company called Mare Crisium Studios and began development of Stars: Supernova Genesis. This was intended to be a much more advanced game, with significantly better graphics, and also to remove some of the irritations of the original, such as the high level of micro-management. However, there was little interest from games publishers, who by that time had become focused exclusively on the video game console and high-end 3D games markets, and so the project was eventually abandoned. Rights to the ingame graphics remained with Empire, until they were acquired by Zoo Games. ^ http://www.starsfaq.com/articles/sru/art138.htm Race Design, Step by Step. Mahrin Skel. Stars!-R-Us. ^ Bary Kearns; Wesley Clifford; Rick Steeves (eds.). "Official Stars! Strategy Guide". Stars! AutoHost. ^ "Windows Virtual PC: Home Page". Microsoft.com. Retrieved 2012-03-14. ^ Walker, Trey (March 16, 2000). "Stars! Supernova Screens". gamespot. Retrieved 2015-06-23. ^ Graft, Kris (7 May 2009). "Zoo Publishing Picks Up Empire Slate". Gamasutra. Retrieved 12 May 2009. This page was last edited on 2 August 2018, at 01:18 (UTC).